In 1636 Thomas Norris of Stamford cast a ring of five bells for Edenham church but at various times these have all been recast and form the back five of the present ring. The oak frame was made and installed in 1807 by the village carpenter Amos Higgins to a plan supplied by the Whitechapel Bellfoundry. The timber for this was "pit sawn" on the village green from timber supplied from the estate of the Duke of Ancaster. At the same time the louvres were also installed by Higgins. There have been members of the Holmes family living at Edenham ever since William I and Catherine moved there from Whittlesea in 1810. William was a renowned wrestler and was employed as a forester by the Duke of Ancaster on the Grimsthorpe estate. He is known to have been a ringer prior to moving to Edenham and his son William II, who was born in 1822, from his record book which is still in existence appears to have been quite advanced for that time. His son, David, rang the 6 am "apprentice bell" and the curfew bell. David ran away to sea and became a harpoon thrower on a whaler based at Harwich. On leaving the sea he settled in Cambridge. Arthur Inch Holmes the second son of William II was born at Edenham in 1877 and rang a total of about 140 peals mainly with the Revd H Law James. Both of his sons William and Arthur were ringers as is William's son Andrew and Arthur's daughter Margaret. Although all the Holmes family have been ringers it was Arthur Inch Holmes who brought Edenham into prominence as a bellringing centre. In 1908 he was encouraged by the then Vicar, Rev A H Galton to raise the money for a new treble. When Revd Galton died in 1921 he left provision for two trebles to be added to make eight but unfortunately his will was contested and the money was swallowed up in legal expenses. When Rev Rowlands became vicar in 1929 he immediately encouraged the ringers to raise the money for the trebles so that in 1931 the necessary £210 had been raised and the bells restored. It was then discovered that the tenor was cracked and this was recast some four cwt heavier at a cost of £92. William III the son of Arthur Inch Holmes was born in Edenham on 2nd September 1912 and after leaving school at the age of 14 he became an apprentice joiner with Scotney's of Bourne at a wage of ten shillings per week and had to provide his own tools. He lodged at Long Sutton receiving five shillings lodging money. His lodgings consisted of bed and a cup of tea for breakfast. He had to take his food from home for the week in a suitcase. He soon moved on to a Sheffield based firm who were building 32 Council Houses in Bourne. This firm paid him 9d an hour which was increased first to 11d and then to 1s 5d. When work became scarce Bill moved to North London returning to Bourne after about 12 months. This was of course the time of the depression and as things became more difficult together with his father and brother they bought a lorry and did whatever work was available. In 1936 Bill went up to London again for about six months and when he returned home he did contract work with the lorry. In 1940 he was called up by the Army and was employed on mine disposal work for about three years before being transferred to VIP driving. He was driving at the Yalta and Potsdam conferences and remembers particularly transporting Lord Mountbatten, Field Marshal Alexander and General Wilson. After demobilisation he returned to Edenham and found he had to start building up a business again. For most of the time he did long distance lorry driving but also did some joinery work. It was whilst roofing in Maxey that he had a very serious accident which put him off work for about 18 months. Bill learned to ring handbells at a very early age and he rang 1/2 whilst his father rang 3/4/5/6 and his brother Arthur 7/8. Although he started tower bell ringing at the age of eight, in those days learners only got a chance when they met short. He started chiming for the early service at the age of six. Bill's first peal was in 1930 on the six at Edenham and was conducted by Jack Lake of Bourne who did most of the conducting in the area at that time. His first 14 peals were at Edenham and the 15th was at Folkingham called by Horace Day. When Edenham bells were augmented to eight the new bells were dedicated by the Revd H Law James and at the time he gave Bill's father a composition of Primrose Surprise Major and so Bill's first peal of Surprise on 23 April 1932 was the first peal in the method. Although Bill had a peal attempt with Law James which failed he never actually rang one with him. Horace Day was something of a character and on one occasion when Bill couldn't get home for the weekend he joined Horace for the usual Sunday morning routine. After ringing at Deeping St James, they then cycled on to ring at Market Deeping with a stop on the way at "The Bell" for refreshment. When they came out they met the parson who was making the same journey also by cycle, He remarked to Horace "Ah, so you ran dry did you?". To which Horace replied "Well, you know parson we thirst after righteousness". After ringing Horace attended the service at Market Deeping sitting near the organ so that he could leave through a door at the back to "The Vine" during the sermon but he was back in time to sing the last hymn! In later days, Horace's, friend Fred Brightman would accompany him on his ringing excursions to look after him. On one occasion Horace called at Bill's mother's throwing his hat in first to make sure he would be welcome but unfortunately for Horace his hat (a bowler) landed on the kitchen fire! A great friend of Bill's from his wartime days in London, Bill Redrup, came on a visit to Edenham and a peal was arranged for him with Horace conducting. Horace had become notorious for managing somehow to lose peals near to opening time so by devious means the band obtained the composition and all went well until very near the end when he suddenly said "you needn't worry I know what you're up to the old man isn't finished yet". The band were so surprised that they didn't notice until too late that Horace missed the next bob and the peal was lost! Jim Musson who was tragically killed in a road accident was a regular visitor to Edenham for many years. He had been taught to ring at Folkingham at the age of ten by C T H (Cotey) Bradley who for many years brought him to Edenham on the back of his motorcycle. After Jim moved to Silk Willoughby he cycled to Folkingham on practice nights and Cotey, who by that time had bought a car, brought him on to Edenham. Many of us still remember Jim and his bike. Cotey had a set of tuned house bells which he had fixed on a frame and he and his brother used to take these to the neighbouring markets and ring them for special occasions. Bill inherited these bells. Bill took over the tower captaincy at Edenham when his father died in 1958. By maintaining good relations with the church's near neighbours and in particular successive vicars, the bells were freely available for all forms of ringing. On more than one occasion, due to diary mix-ups two peals were rung on the bells in the same day. Bill's father had always had the ambition that one day there would be a ring of ten at Edenham and no doubt this would have been done had it not been for the intervention of the Second World War. With the help of many friends either financially, fund-raising or practical help in the tower and through the support of the Grimsthorpe Estate and the Church authorities two new bells were cast and dedicated on 11th May 1985. So another era of ringing commenced at Edenham. Because of his long distance driving Bill was not able to do much peal ringing until the mid 1970s and much of his peal ringing was due to the influence of Mike Maughan. His first peal with Mike was on l8th August 1978 and since that time, as well as ringing regularly with Mike, he was in demand by most of the peal bands in the county. his resulted in a total of 1,104 peals with his last being rung at Sutterton on 20 February 1991. 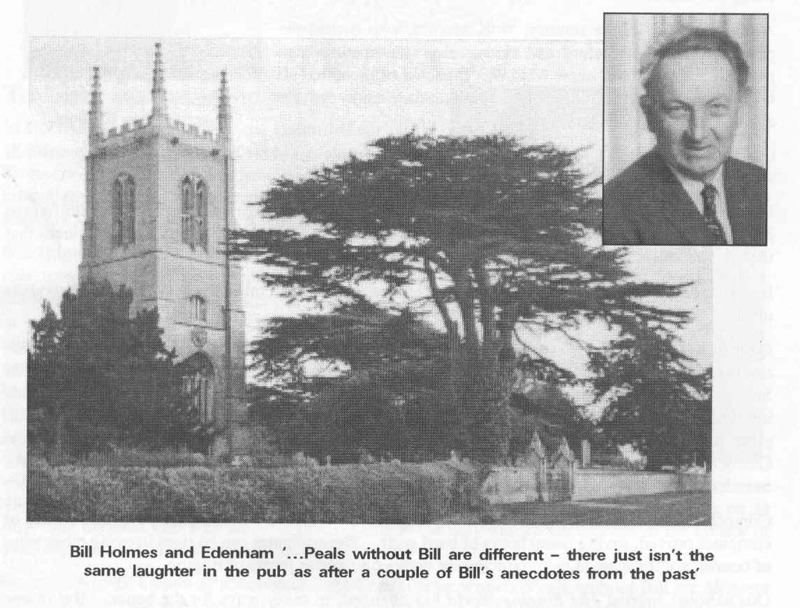 Bill married Eva in 1951 and there was always a very ready welcome and hospitality for visiting ringers at their home close by Edenham church. Bill died at the age of 79 on 16 January 1992 and Eva died six days later. Bill is remembered for many reasons but one of the most enduring is as a raconteur. His fund of stories was vast and his style of delivery totally individual. He was most definitely one of the characters of the Exercise. As a couple Bill and Eva complemented one another perfectly.